An office job severely restricts your freedom. This is of no surprise to anyone who is already in the workforce and is living the dream of having a desk job. Go ahead and read all of the articles about desk jobs, they all say basically the same thing. In short, desk jobs are dreadfully horrible and will eventually kill you. If you are still in school and have yet to decide what you want to do with your life and which career path to follow, read this very carefully before making any decisions. There are many good reasons why people desire to become police officers, paramedics and firemen, it is because with these types of jobs, you aren’t going to be stuck behind a desk all day, every day. We don’t know of very many people who have never complained very much about their miserable working life behind the desk of a typical nine-to-five job. A desk job is never a road to greatness, it is a road to mediocrity. 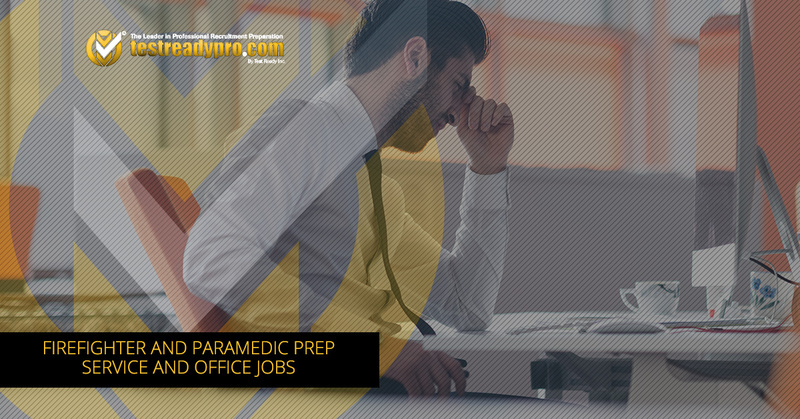 Test Ready Pro, your firefighter and paramedic prep service in Ontario, offers up the reasons why you don’t want to pursue a desk job. It is no secret that sitting is not the best thing for your health. And sitting for eight-plus hours a day is quite literally killing you. There are plenty of studies that show just how bad extended sitting is for you. Sitting causes people to gain weight, lose muscle and increases your chances of diabetes, heart disease and musculoskeletal disease. There are even studies that link sitting too much with an increased chance of developing cancer. Not only does pounding away at your keyboard cause carpal tunnel syndrome, but your keyboard also contributes to your risk of colds, flu and E. Coli. That’s right, in addition to damaging the nerves in your wrist permanently, your keyboard is home to a host of germs you don’t want to be in contact with. When you sit and stare at the same four walls day after day after day, your days at work are filled with boredom and boredom kills. No kidding, a study found that people who frequently complain about being bored tend to die young. You aren’t very likely to get bored being a paramedic, firefighter or police officer. An economic recession, a company cutting costs or a loss of job due to automation, there are plenty of reasons to be worried about losing your office job. You are also expected to put your heart and soul into a job that can be eliminated at any time. That hardly seems fair. You can bet that there will always be a need for police officers, firefighters and paramedics. And we doubt we will see these positions turned over to robots any time soon. If you want to avoid having a job that literally tries to kill you, become a fireman, paramedic or police officer. Contact Test Ready Pro today.